Why not bring the outdoors, indoors with our stunning pallet bar. Here at Solid State UK we have years of experiencing when it comes to providing a comprehensive mobile bar hire service. Our pallet effect bar is the latest addition to our bar hire range and it has already proved popular at a whole range of events. Like all our bars we have three different package options for hire of our pallet bar. The bar is available for hire as a cash bar, a pre-paid bar or a mixed bar. If you were to opt for our pre-paid or mixed bar packages we have voucher system you can give out to your guests to help kick start the party atmosphere. 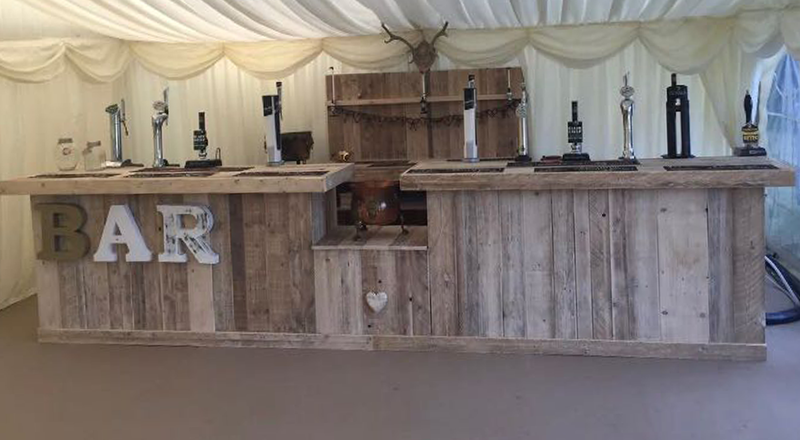 Our new vintage style pallet bar can fit perfectly into any rustic themed wedding, barn dance or classical styled event. We can provide a complete bar service with our pallet bar where we can provide everything from glassware, fridges, modern payment systems, TENs license, full trained staff and menus for the tables all free of charge. We also offer an extensive selection of drinks at very competitive prices for all our events. If you are interested in our pallet bar or would like more information on any of our bars please don’t hesitate to get in touch. You can give us a call on 0116 2885956 or alternatively you can email us on info@solidstateuk.co.uk. All our bars are available for hire in Leicestershire and the rest of UK including Northampton, Coventry, Derby, Nottingham, Birmingham and London.